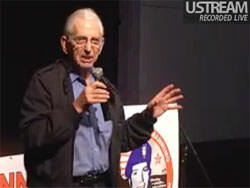 Daniel Ellsberg speaking up for Bradley Manning. Watch the Oakland event here. The Days of Action to Support Bradley Manning kicked off with packed hall in Oakland, Thursday, September 16, "Afghanistan: Occupation, Wikileaks, and accused Whistle-blower Army Pfc. Bradley Manning" with Daniel Ellsberg, Col. Ann Wright (ret. ), and Ray McGovern. Watch the event here. So far, 1,050 individuals have donated a total of $59,300 towards Bradley's defense. Another 38 supporters have given $6,800 directly to the legal trust account. With this, the defense team has been able to hire a computer forensics expert, a classified information security expert, and will soon include a psychiatrist as well as a criminal investigator. Next steps for the international campaign to free Bradley Manning will include outreach and education at upcoming events on the anniversary of the US occupation of Afghanistan next month, the Stephen Colbert/Jon Stewart "Keep Fear Alive!/Be Reasonable" rally in Washington DC on October 30th, and a bold public declaration, "We Stand with Bradley Manning", that we hope will be signed by thousands and reprinted widely. Bradley's pre-trial Article 32 hearing has not yet been scheduled, but is likely to take place in either December or January 2011, with a possible court martial around April 2011. We only have a few months to build an international campaign to save Bradley's life. Blowing the whistle on war crimes in not a crime!